Women portraying civilians and those representing Axis and Allied forces of Western Europe in 1944 are invited to attend the event. ETO, Home Front, British, French, German and Partisan impressions and displays are welcome and encouraged. All persons attending the event should be acquainted with the general authenticity regulations as they apply equally to all event participants. The following are supplemental guidelines for female reenactors attending the event. Note: the material contained on these pages is not inclusive. All female impressions are accepted and encouraged. 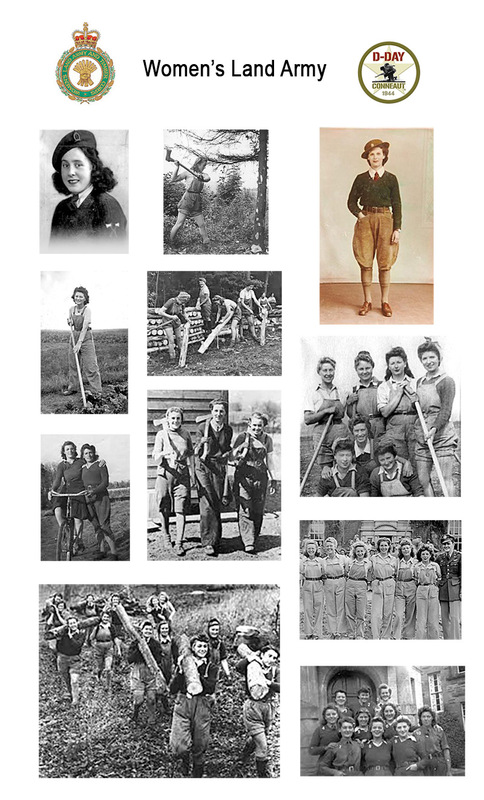 For work wear: Many land girls wore jumpers or tops under their dungarees that were their own. Some were issued Aertex shirts with their dungarees, but often many weren't. Please be advised to refer to the Civilian and women's guidelines for applicable clothing to wear under dungarees. 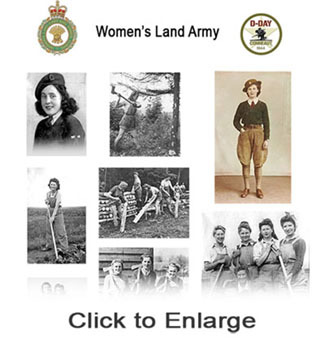 Also, please keep in mind if your impression is a land girl in her work wear, your appearance should be according to your job. Heavy makeup and freshly set hair would not apply here. • Brown or peanut colored work boots, no lug soles. • WLA issued "milking coat"
Women's utility dresses May 14, 1942. Dresses are designed to avoid dullness Examples of women's "utility suits." • Jackets: Maximum length 28"
• Slacks or pants: Maximum length 45", bottom width 14 ½"
• Suits: i. Skirt: Length 28 ¾" - 30", Sweep according to fabric 65" - 88" ii. Jacket: Length 23 ½" - 28"
• Evening Dresses: Maximum basic length 59", Sweep of hem for all non-transparent fabric 144"
• Evening Jackets: Shall not exceed 25" from neck to hem, Hem limited to 1 ½"
• Evening Skirts: Length 45", Sweep of hem 144"
100% Cotton or 100% wool socks and flat leather shoes (or shoes with a minimal heel) or leather boots to allow ease of movement. 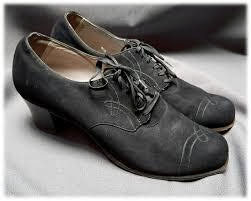 Please see pictures here and in “Allied Civilian Participants” for the correct style of footwear. No modern-looking soles. Maquisards and farm/village women should wear either 100% cotton or 100% wool ankle socks or be bare-legged. 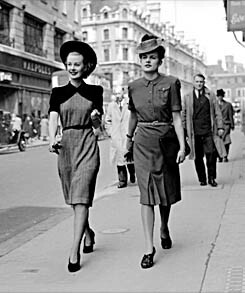 Female civilians portraying city dwellers can choose the above or wear appropriate seamed hosiery (see Allied Civilian guidelines). Period correct jewelry only. Wedding bands should be thin. Female Maquisards and farm/village women should wear little jewelry (e.g. wedding band, watch) or no jewelry. 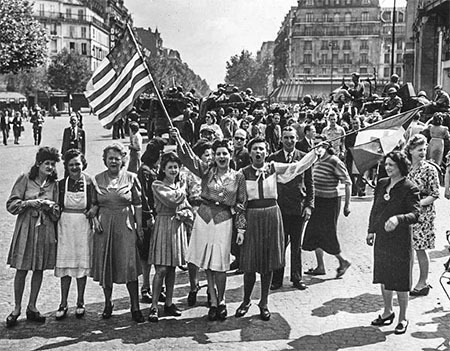 Other civilian women should wear what would be appropriate for wartime France. 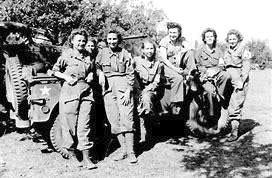 Women portraying military impressions may wear any authentic combination of Uniforms and Equipment as would have been seen in the European Theater of Operations prior to or during 1944. Uniforms and equipment must be original or quality reproductions. Please refrain from including in your display or wearing original or reproduction items that do not date to c.1944. For women planning to participate in the battle reenactments, additional requirements apply. These are listed in the Authenticity Regulations for the respective nationalities. 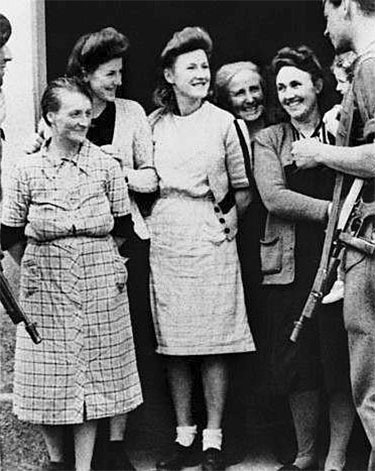 Women wishing to participate in tactical (excepting French Resistance fighters) must adopt a male impression for and adhere to the guidelines for that impression. Uniforms, regardless of impression - unit, nationality, or gender - should be worn in a regulation or documented fashion. As these are military uniforms of the respective countries, although no longer in use, they should be worn in a manner befitting a soldier of the time period. Overall military appearance and proper wear of the uniform and equipment will be required in camp. (see Military Impressions for the Beach Landings for additional information and requirements for those wishing to participate in the tactical.) 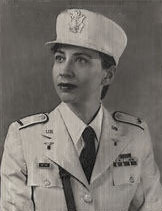 Though some women's attire is difficult to obtain, women portraying military impressions should ensure that they wear the entire uniform as it was intended in WWII. Alternate impressions and wearings may be substantiated through photos and we encourage participants to share their information with us and the public attending the event. Female uniforms should be complete and not mix grades of uniforms or insignia. 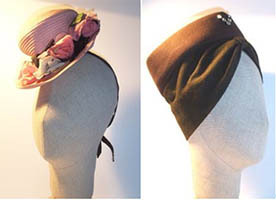 Appropriate headwear should be worn for the circumstances. 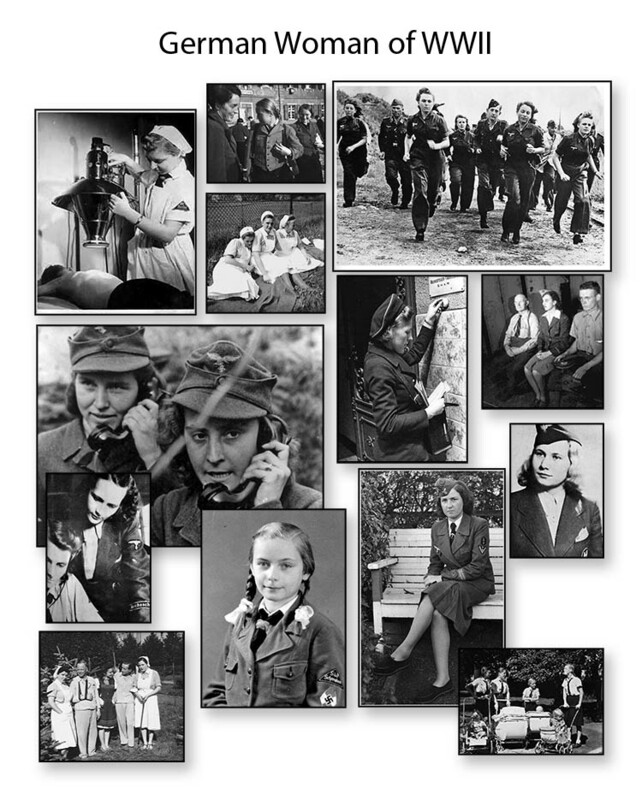 We are aware that the Army Nurse Corps had a variety of uniforms. 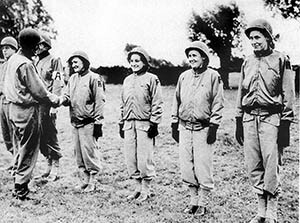 The only uniforms authorized are June 1944. The following uniforms are NOT authorized to wear by participants as they were not the norm in the ETO, however they may be displayed as part of a uniform grouping display, and/or may be worn after hours when there is no public presence. *Note: The off duty dress is a private purchase item and not listed as an issue item. The off duty dress is worn when not on duty. In camp we try to strive to represent the training forces in England and invasion forces of France, therefore the off duty dress is not a work uniform. This uniform is more frequently seen in England and only seen in France after the liberation of Paris. While this uniform is authorized please understand that it is not representative of a uniform that would be worn in garrison or in field work, so that when dealing with the public for educational purposes please make sure to distinguish the difference in the uniform. This is also true for the 1942 Beige Dress Uniform. 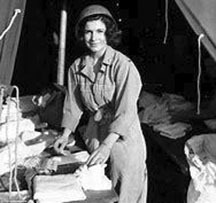 SOURCES: QM 3-2 QUARTERMASTER SUPPLY CATALOG, LIST OF ITEMS FOR TROOP ISSUE WAC' AND NURSE' CLOTHING AND EQUIPMENT, REVISED 7 OCTOBER 1943. NURSE, PHYSICAL THERAPY AIDE, HOSPITAL DIETITIAN MANDATORY CLOTHING AND INDIVIDUAL EQUIPMENT ALLOWANCES FOR THEATER OF OPERATIONS-SUMMER/WINTER CLOTHING FOR TEMPERATE ZONE, 11 NOVEMBER 1943 uniform. 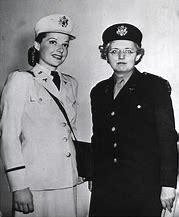 All US female military participants must wear the appropriate shirtwaists/ties/accessories for their uniforms. 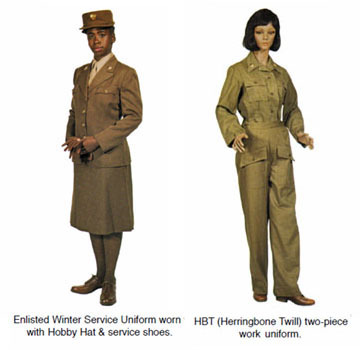 Resources we would recommend to those just becoming acquainted with their military impression of choice include Dressed for Duty and Quartermaster Study Guide, A Wardrobe for the Women of the Army written in 1945. 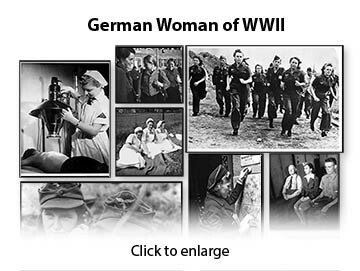 We would also recommend Women for Victory: American Servicewomen in World War II. 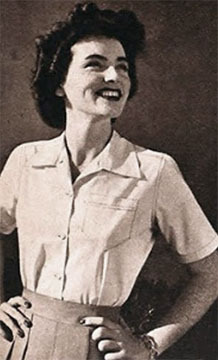 White poplin, worsted wool, or cotton blouse with long sleeves or short sleeves (depending on season) and either two open-topped breast pockets or one open-topped pocket (on the left) and one flap-topped pocket on the right. In the case of the two open-topped breast pockets, there should be a two-button closure on each pocket. In the case of the dual pocketed shirt, there should be a two-button closure on the open-topped pocket and a single button closure on the flap-topped pocket. The buttons should be flat, white, and four holed. 4 Larger buttons down the center front of the shirt, similar but smaller buttons on the pockets and cuffs. The long sleeved version of the blouse is to be worn underneath the jacket. The short sleeved version of this blouse isn't worn with the jacket, but is acceptable to wear for summer events. Jungmädel uniforms may also have 2 buttons at the waistline of the shirt which button into the waistline of the skirt. • The uniform jacket consisted of a faux velour/ faux suede. Original jacket colors varied from light tan to caramel brown. The jacket is waist length - it is shorter in the back and comes to two points at the hips in the front. It is single breasted with six buttons closures. Four patch pockets with a single button closure on each, are on the front. The back of jacket has two half belts at the hip for fit. The black triangular district patch of the BDM member's home district is worn on the upper left sleeve. Below this is the red/white diamond shape Hitler Youth insignia. 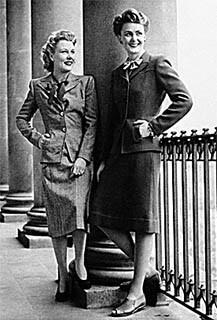 Single breasted feldgrau jacket with three button fastening with two rectangular skirt pockets and a single open left breast pocket. The upper collar must be unlined (unless portraying and officer impression, please check with Axis Command for this event). The jacket bears the oval black cloth patch with silver edging bearing the SS runes. The SS version of the National Emblem is worn on the upper left sleeve 16 cm from where the sleeve comes off the shoulder. Cuff title bearing the Reichsschule-SS (only in a training role) all others must bear the SS-Helferin to be worn 14 cm above the edge of the cuff. NO SIGNALS BADGE IS TO BE WORN ON THIS UNIFORM AS THIS IS A 1944 EVENT AND IT IS HISTORICALLY INACCURATE TO WEAR THIS ON THE UNIFORM. 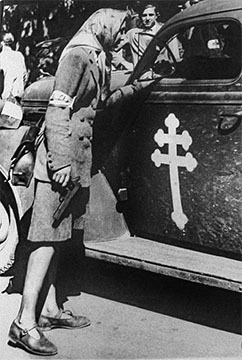 *NOTE: In September 1943 Heinrich Himmler, the Reichsführer, gave the order that the SS-Helferinnen are not allowed to wear the national emblem (Reichsadler) on the blouse (but were allowed on the jacket, the coat and the cap) and not allowed to wear the sign of lightning anywhere on the uniform (Signallers Badge) [Tagesbefehl 144/43, 6.9.1943, Bundesarchiv Berlin, NS 32 II/56, Bl. 149].